Pompeys Pillar is located in Yellowstone County, Montana. One of the most popular attractions to Pompeys Pillar is the signature of famed explorer Williams Clark. Pompeys Pillar is a huge sandstone rock formation, standing 150 feet (45 meters) tall. Located in Yellowstone County, Montana, it was given National Monument status in January 2001, making it only the third such site in the state. At only 51 acres in size it is one of the smallest National Monuments in the country. The site is managed by the United States Bureau of Land Management (BLM). Why Is Pompeys Pillar Unique? On July 3, 1806, Williams Clark (1770-1838) and Meriwether Lewis (1774-1809) decided to split up during there famed expedition, staying separated until they reached the meeting point of the Missouri and Yellowstone Rivers. A little over two weeks later on July 25, Clark sighted Pomepys Pillar. Clark climbed the pillar and noted that it provided an extensive view of the surrounding area. He also noted that the rock had Indian pictographs on it. Before departing, Clark signed the sandstone structure with his name and date putting: 'Wm. Clark, July 25, 1806.' This makes the inscription the last remaining physical evidence found along the route Lewis and Clark took on their storied expedition. He named the rock "Pompy’s Tower" after Sacagawea's (1788-1812) young son Jean Baptiste Charbonneau (1805-66), whom he had nicknamed “Pomp.” However, in the 1st edition of The History of Lewis and Clark Expedition in 1814, its named was changed to Pompeys Pillar. 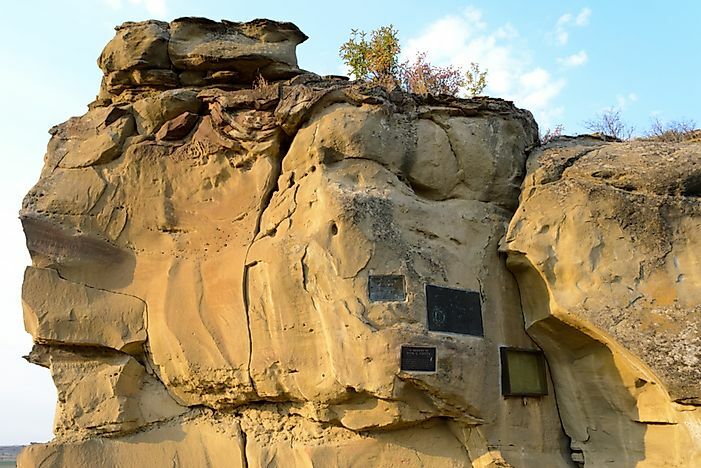 The biggest draw to the site is to see Clark's signature, which has had to been re-engraved several times due to erosion from the weather. However, it has enclosed behind Plexiglas in order to be protected from the elements. In 2006, the Pompeys Pillar National Monument Interpretive Center opened. This center houses exhibits highlighting the journey that Clark, Sacagawea, and the rest of their detachment took through the Yellowstone River Valley. It also highlights Native American culture in the region, the area's plant life and the history behind Pompeys Pillar. The area is also great for nature lovers, as there are plenty of trails to walk along and admire the area around the Yellowstone River. Bird watchers will also get a kick, as there are a number of bird species that make their home near the site. There are also plenty of tables set up throughout the area around the monument for visitors to stop and eat. Pompeys Pillar rises above the Yellowstone River, the longest free-flowing river in the continental United States. Along it banks are where an abundance of Cottonwood and Willow trees grow, which are home to vireos, warblers and other bird species. Directly to the south prairies can be found, which are where falcons, pheasants, and others are found. Erosion from wind, rain, and snow is one of the site's biggest threats, it not only threatens Clark's signature and the Indian pictographs, but the actual sandstone structure of Pompeys Pillar itself. The fluvial chances to the Yellowstone River are also causing further erosion concerns for BLM in relation to the site. Lastly, there is also the chance that tourists vandalize the structure by carving into the stone, which has happened in the past.